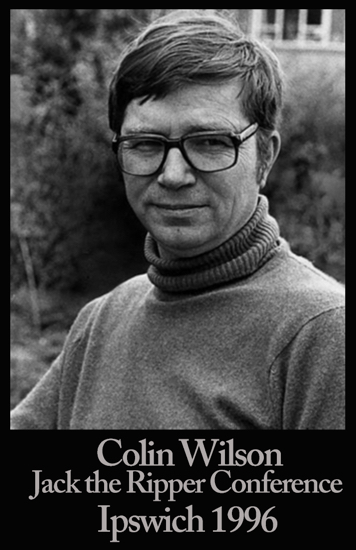 We are very pleased to bring to you author Colin Wilson's talk at the first ever Jack the Ripper Conference, held in Ipswich 12-14 April, 1996. This 22 year old audience recording was rescued from a second hand bookshop by Mark Ripper and we are grateful to Mark for saving this piece of Ripperology history so that we may share it with you. Originally recorded on a 120 minute long cassette tape- I left the tape flip around the 55 minute mark intact- and sometime later transferred to CD, this specific recording is believed to be from the collection of the late Jeremy Beadle. It is beginning to show its age, but the historical value of the talk outweighs the deteriorating quality of the audio. I applied noise reduction to eliminate a significant amount of white-noise hiss and amplified the vocals. After so many years, the recording is in a poor state, but to my ears still listenable. Also in iTunes, TuneIn Radio, MixCloud and any old podcast app you can find. Thank you again to Mark Ripper! Last edited by jmenges; 06-16-2018, 03:32 PM. Colin Wilson was a serial believer. He agreed with each and every theory as it came along. It certainly seems that way, Simon. Does anyone know where in Ipswich the first conference was held? It would be ironic if it were in The Great White Horse - that's where John Harrison, of Harrison, Barber fame, ended up. It wasn't an old building and it wasn't in the town centre but I can't remember the name of it now . Did your burger have a bit of a horsey flavour? Last edited by MrBarnett; 06-17-2018, 02:00 AM. My impression, too, Simon. He was somewhat credulous - to put it mildly - when it came to the occult and parapsychology, and perhaps this tendency infected his thinking about the Ripper case. Still, he was never less than interesting, so many thanks to Mark Ripper and Jon Menges for making this recording available. Colin was a collector of theory's and stored them. I had a correspondence with him back in 1975, he was generous with his time, and as well as the letters I received which I still have somewhere, he sent me a new publication Ripper book , as well. He was very enthusiastic about the case, and relished new ideas. I will find time to listen later. It was interesting to hear this. I have a friend who was an original member of the Cloak And Dagger Club who has this talk on video. He's also got a lot of video camera footage of other events stashed away somewhere. I am aware that a video of his talk and others from the late 90s and early 00s have circulated amongst collectors. Perhaps one day I'll be able to see those, or at least get a rip of the audio of a few of them. To be truthful I could not understand a word of what he was saying, the audio is very bad. I transcribed the talk in full and it appears in the latest issue of Ripperologist.